Be the first to share your favorite memory, photo or story of Ronald "Ronnie". This memorial page is dedicated for family, friends and future generations to celebrate the life of their loved one. Ronald Dean Capps, son of Harold Glenn “Tom” and Eileen Anthony Capps, was born, September 8, 1947 in Camden County, Missouri. 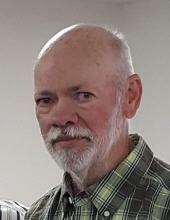 He departed this life, Friday, September 14, 2018, in Windsor Estates Care Center, Camdenton, Missouri at the age of seventy-one years, and six days. Survivors include his brother, J.T. Capps of Macks Creek, Missouri and his nephews, Aaron Capps and wife Dana of Camdenton, Missouri, David Capps and wife Annette of Camdenton, Missouri, Ben Capps and wife Nancy of Ashland, Missouri and James Capps and wife Kim of Camdenton, Missouri as well as a host of great nieces, nephews, other relatives and many, many friends. Ronnie has always been proud to be called a native of Camden County. In his younger years he started his working career at A & W Drive-In. He graduated from Camdenton R-III School in the class of 1965. For thirty-two years he worked at First National Bank and then was elected Auditor for Camden County for eighteen years where he served the people of Camden County proudly. Ronnie made a profession of faith and was a lifelong member of New Home Baptist Church where he served as a Deacon. He had also been the Music Director for the church. He was always active in Bible School. In his spare time, he was very active in the community that he has always loved. He was a big supporter of the Pride of the Lake Marching Band, where you could always see him helping where ever he was needed. He was a member of the Kiwanis, Missouri Music Men and Missouri Association of Counties. He had participated in the First Baptist Church Easter Pageant for many years. He loved to travel and had explored many places. Ronnie has touched many people’s lives with his kindness and his Christian influence. He has blessed his family and friends with many wonderful memories that they will always treasure. He was a loving brother, uncle and a caring neighbor and friend. Funeral services will be held at 2:00 p.m., Friday, September 21, 2018, in Allee-Holman-Howe Funeral Home, Camdenton, Missouri. Burial will follow in Dale Blair Memorial Cemetery, Camdenton. Visitation will be from 5-7 p.m., Thursday evening in the funeral home. Memorial donations may be made to Pride of the Lake Band Boosters or New Home Baptist Church and left at the funeral home. To send flowers or a remembrance gift to the family of Ronald "Ronnie" Dean Capps, please visit our Tribute Store. "Email Address" would like to share the life celebration of Ronald "Ronnie" Dean Capps. Click on the "link" to go to share a favorite memory or leave a condolence message for the family.